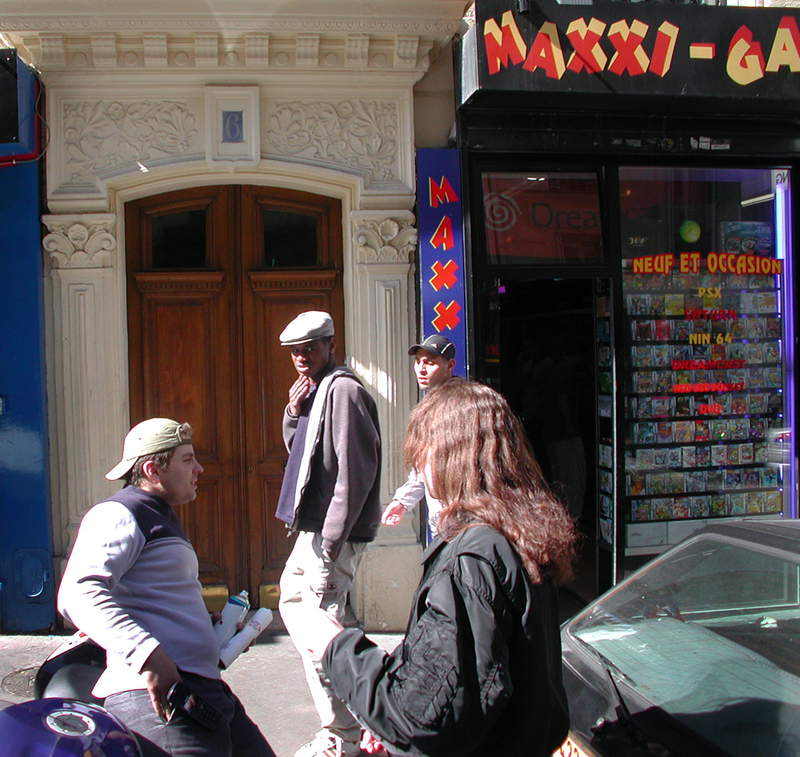 With only two days to go before leaving Paris, we have begun to feel a little frantic. We don’t want to go home. We want to stay here. But even granted we have to go home, there is too much we haven’t gotten to do. So this morning was given over to making up some of the most important oversights — particularly, climbing the towers of Notre Dame de Paris to see the many carvings along the ramparts, including the most famous one, the Stryga, a grotesque with a garish nose, two horns, wings and the ears of Prince Charles, resting his chin in his hands looking out over Paris below him. 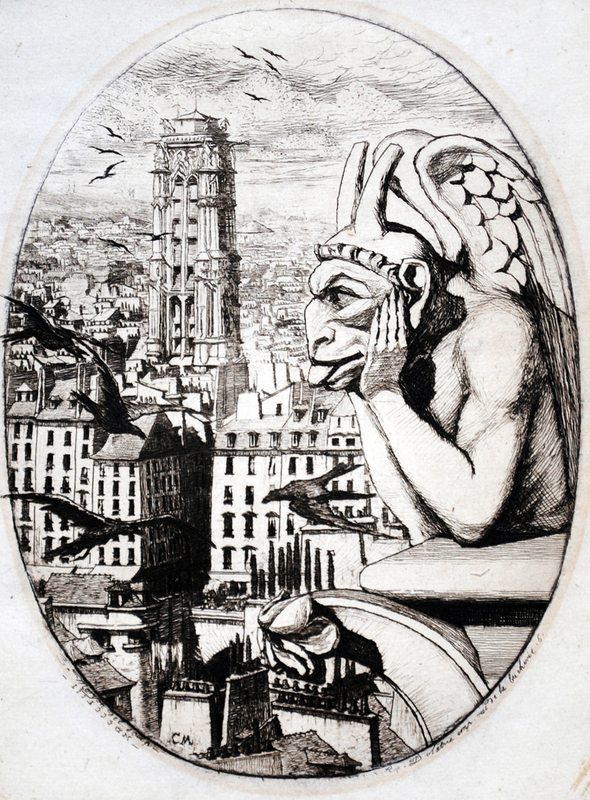 He is a kind of ensignia for the cathedral, most famously in a 19th century photograph by Charles Negre, and an etching by Charles Meryon. If anything is the mascot of the church, it is the Stryga. But he has a lot of company at the tops of the towers. Some have buzzard heads, some have wolves heads. One is eating the carrion of another, tearing long raw chunks from its side, like Goya’s painting of Cronus eating his children. We got to the cathedral by 9:30 a.m., when they open the tower, but there was already a long line. 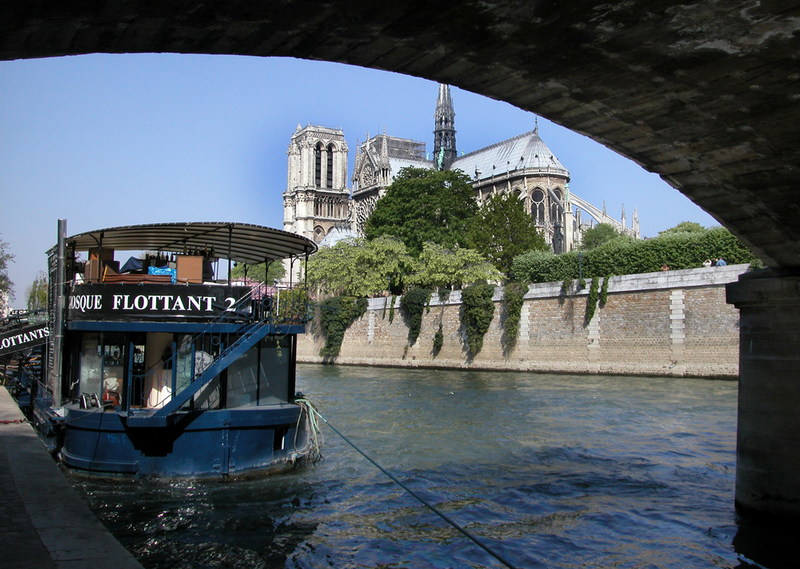 Weekends are busy for Notre Dame, with an invasion of tour busses parked under its apse and lines of tour groups flooding the parvis in front of the cathedral. And the line for the tower proved to be even more infuriating, because they only let 20 people in at a time, and when you finally get inside, out of the blowing wind, you find yourself on another queue, just to pay your admission. You wait and wait, and finally, they let you through. The wait must have been a half hour. The climb is at least as strenuous as the one at Chartres, but I’m in better shape after all the walking we’ve done, so although I got winded, my legs held up. The first stop is a large vaulted room with a gift shop. They don’t miss a trick on this tour. But you continue up till you get to the level just above the row of kings and pass around the north tower, where the Stryga holds court. 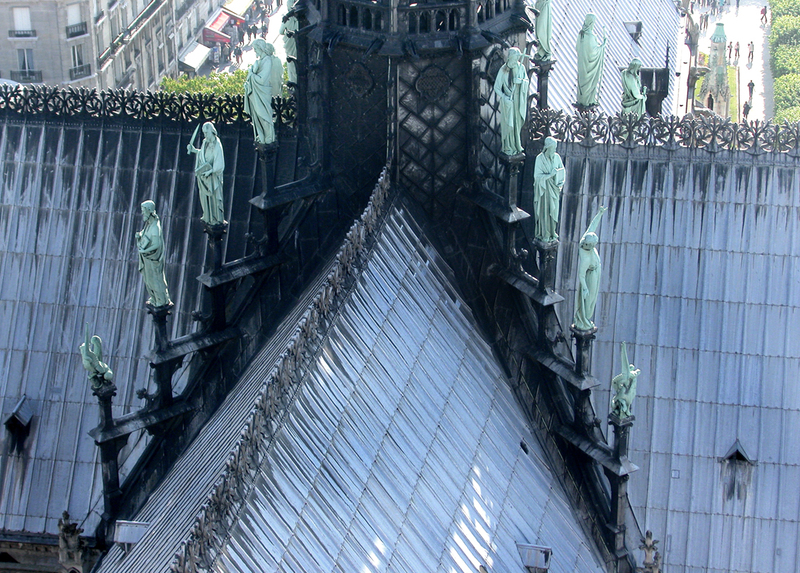 As you pass between the towers, you get a look at the cathedral’s lead roof underneath you, and all the stone carvings that hide up in this stratosphere. And when you circle around the front of the south tower, you come upon a traffic cop who prevents you from climbing up to the very top of the south tower — at least until the previous 20 people have descended. They you get your turn, and are told you have only 5 minutes at the top. 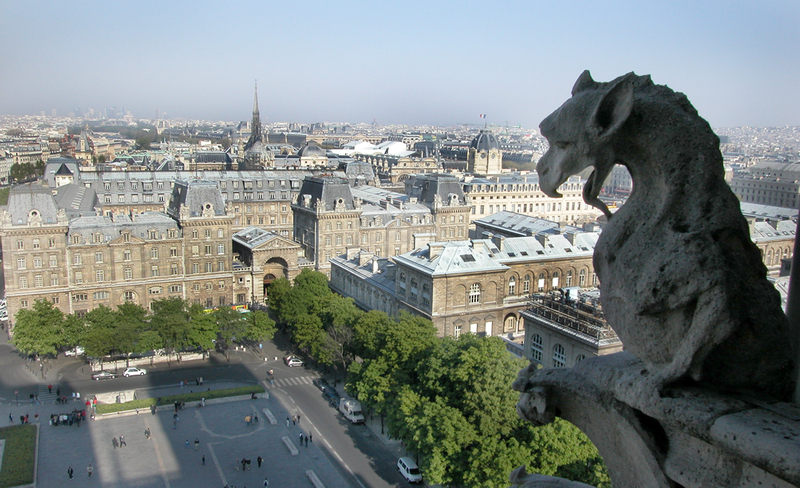 It is a heady view from on high, with the Eiffel tower in one direction, and the Pantheon in another. But you don’t get to see as much architecture as you do from the lower level, so when I climbed back down, I tried to reenter the chimeras gallery. The traffic copy stopped me and motioned for me to go down to the exit. He looked a little disgusted with me, in that particular French way, but let me pass and reenter the gallery, where I took another infinite number of photographs before finally descending the stairs to the bottom of the south Tower. There were by actual count 3 billion people in the parvis waiting to enter the cathedral. There was a line just to get through the door. I’ll never find Carole in all this, I thought, but when I got in, I walked down the center of the nave, and there she way, sitting quietly, an unmoving point at the center of all the hubbub. She is always easy to find. 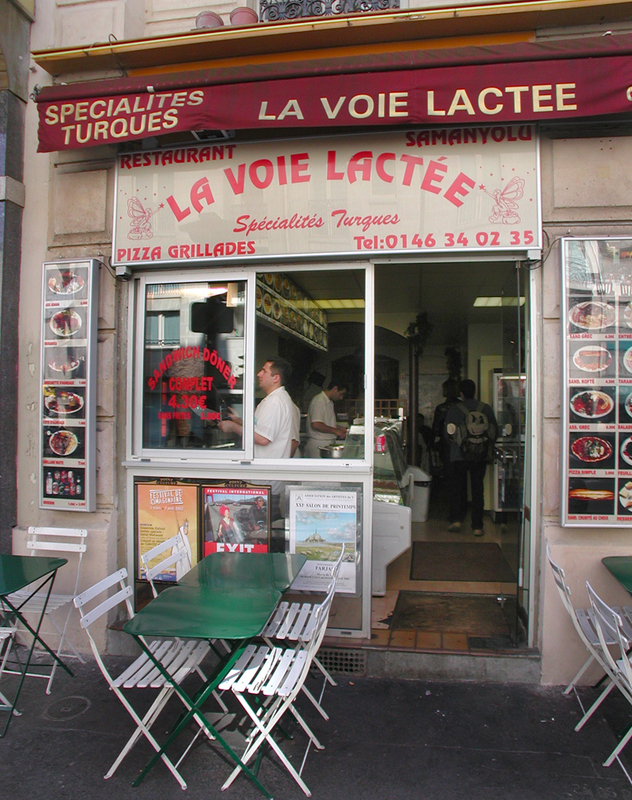 On the way back to the hotel, we walked along the quai, did some last minute gift shopping and lunch at the Turkish restaurant around the corner from the hotel, the Voie Lactae. 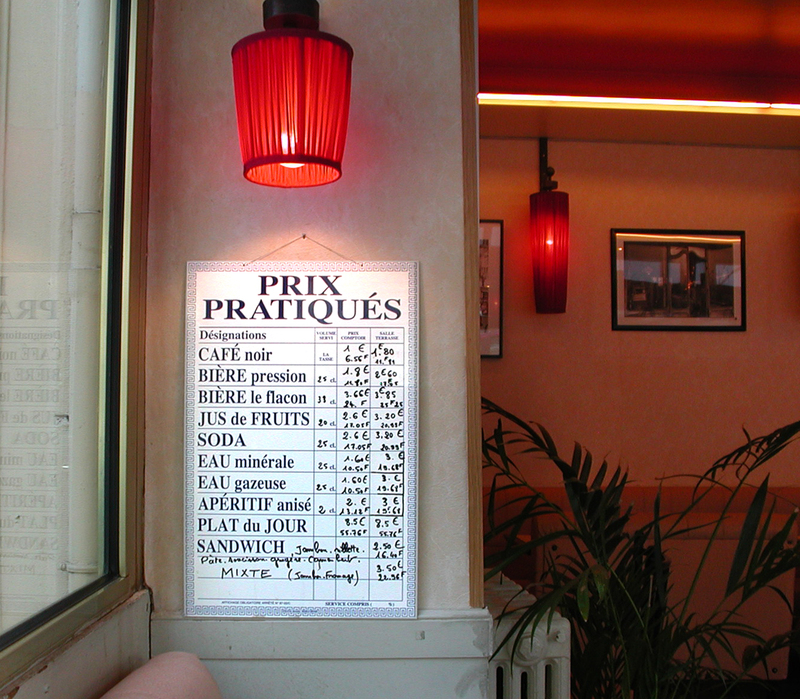 You can’t get a bad meal in Paris. Later in the afternoon, we went for a longer walk down to the river, where we ran into a large angry protest parade along the quai, chanting for Israel to get out of Palestine. Carole was worried that they might do violence to Americans, but I plunged on ahead, walked across the parade and up the street. The walk along the quai beside the Curie Institute was a pleasant promenade, with flowers on one side and water on the other. We walked all the way past the Jardins des Plantes and up the streets past that, looking for a place to have supper. At 7 p.m. we came across a nice looking tiny Basque restaurant and thought it was just the ticket. We were the only customers at this early hour. Until, that is, an invasion of American high school kids on a vacation tour of the Continent. With 13 instant new mouths to feed, the kitchen couldn’t keep up, and our meals took forever to get to our places. The Piperade — a kind of scrambled egg with ratatouille in it, topped with a slice of Basque ham (think American Country Ham) — was magnificent, and a huge serving, so we hardly needed our plat. But we waited — and waited — and waited — while the chef and his one poor helpmate, a young woman, tried to trot out lots of snails and shrimp to the students. Meanwhile, more and more people started pouring into the restaurant. It was grand central station. It took so long, that after we finally got our plats, we declined the desserts — god knows how long it would take to get them — and paid our bill and got the heck out of that madhouse. The pink petals from flowering trees were drifting in the air today and gathered in drifts in the gutters. I was frightened by a big white German shepherd looking dog on the loose. There was a big demonstration in the streets with people carrying French flags and shouting “Quite Palestine,” and we stood around and R. kept leading us down into la monde arabe. But we came out on the other side and had a wonderful walk along the river and saw houseboats and cafe boats and one cafe boat also had a magic show. And when we went to Notre Dame this morning, while R. climbed the tower, I sat in the nave and looked at the windows for a very long time, and the ceiling of the cathedral gradually became rosy and a little bird, like a sparrow, flew up from the center of the nave to the top of the cathedral and sat on a ledge at the very peak of the arch of the central stained glass window. 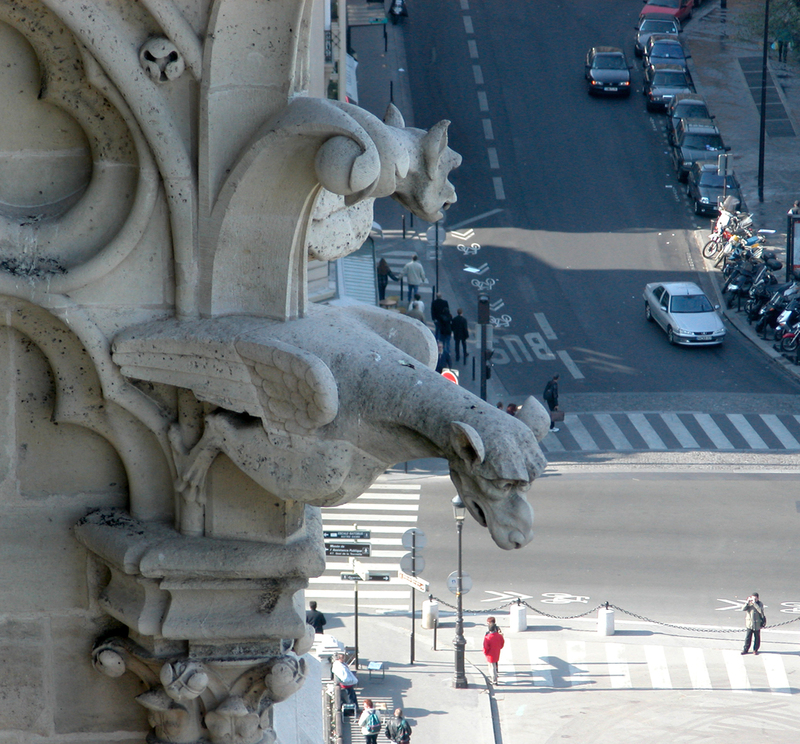 I spent a lot of time in the cathedral looking at the carved stone irises on the capitals of the piers, and outside, I compared the sculpture on the portals with the sculptures at St. Denis and I think the portals at St. Denis are more effective. Supper at the Basque restaurant was wonderful and terrible: We had country ham on an omelet with ratatouille and it was glorious. But I ordered veal kidneys for my plat, and that is what they tasted like. We had wonderful wine and drank half a bottle. At the fruit stands, I found three French apples — a big round ruddy apple; a smaller reddish one; and a little soft yellow one that looks wild. 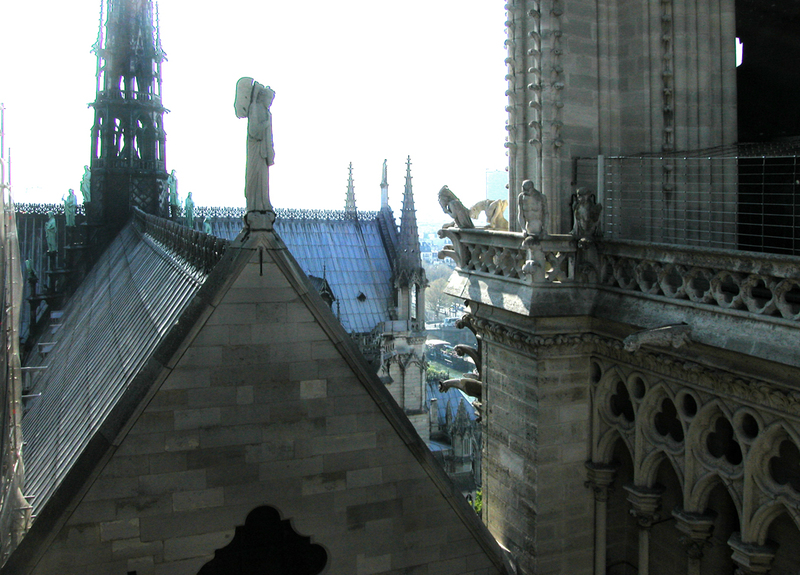 Climbing the tower at Notre Dame de Paris left me winded, but the treasures I found at the top took my breath away. 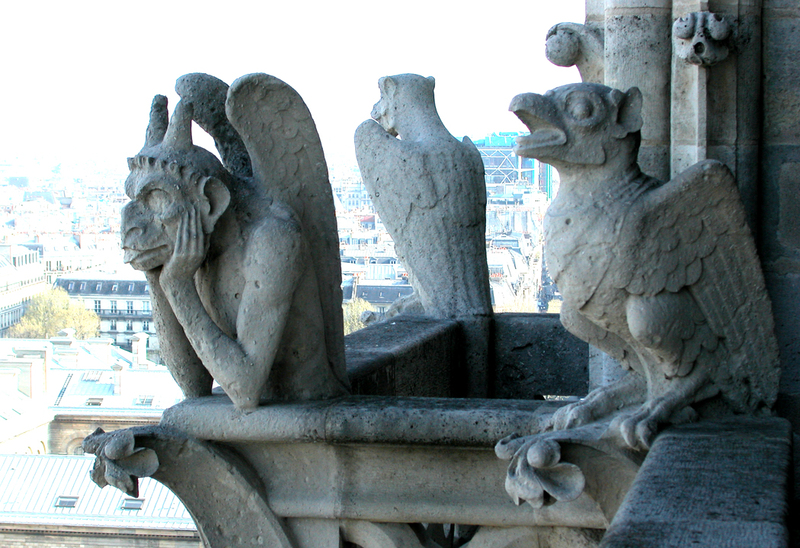 The gremlins and gargoyles — mostly created by Eugene Viollet le Duc as replacements for the originals — were stunning, and like something created just for Victor Hugo. 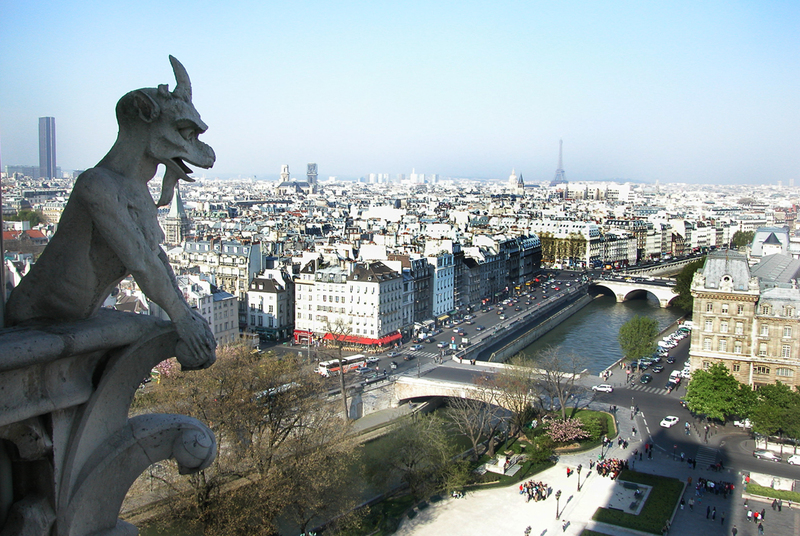 Most particular was the familiar Stryga, the grotesque resting his head in his hand surveying the city of Paris from the top of the tower. I spent more than my time up at the top, in the icy wind of this April day when the weather turned chill once more. 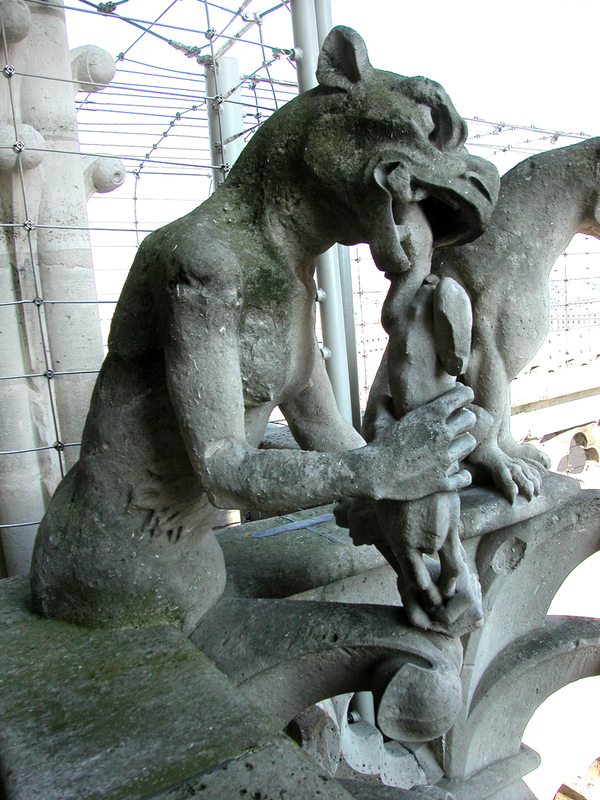 Carole waited down in the church while I sauntered along the parapets taking pictures of every grotesque, chimera, every rain spout and quatrefoil. This visit finally completes the work of cataloguing the cathedral that we began three visits ago. Above all things, the Notre Dame de Paris has been the top of the list of things on our vacation, especially with the Easter service and the organ music. But the cathedral itself, above even Chartres or St. Denis, has been the revelation of this trip. Second to that has been the food, which is just as much a religious experience. After those two items, everything else is further down the list. 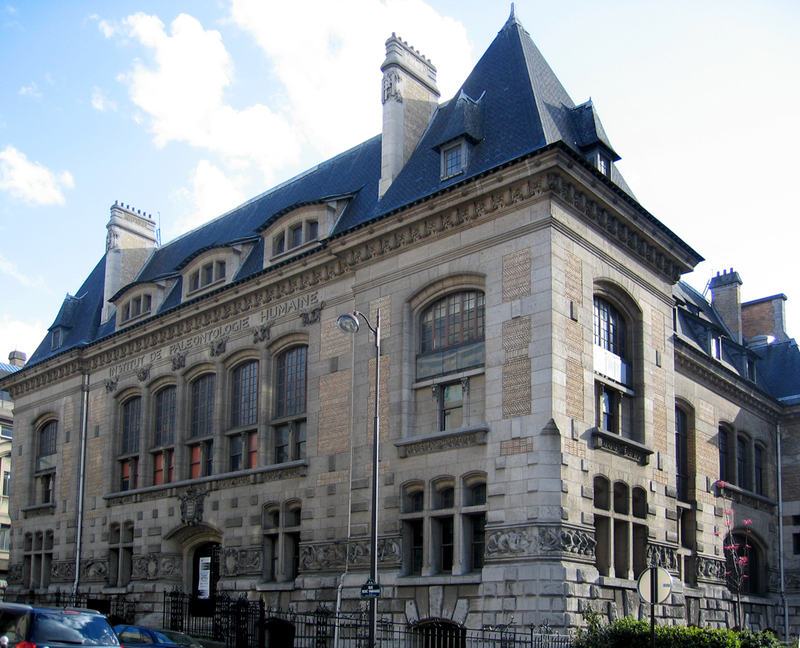 For some reason, I didn’t mention in my notes the Institut de Paleontologie Humaine, which we passed on the Boulevard Saint-Marcel on our roundabout walk after dinner. I can’t imagine why I neglected it: It is a hoot. And a half. 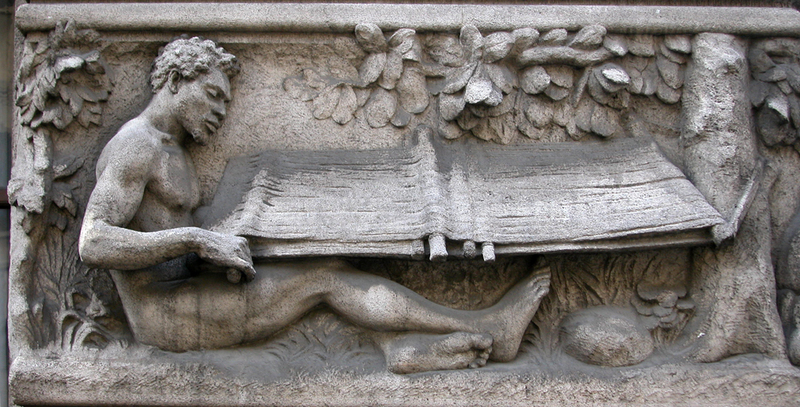 The sculptor Constant Roux (1865-1942) designed a ribbon of sculpture around the building depicting “Primitive Man.” And it is an impressive display of invention and design. It is also a reminder of the pernicious racial ideas prevalent in anthropology then current. Roux has divided primitive peoples into racial groups, African, Asian, American Indian, Oceanic and Caucasian. For the Caucasians, “primitive” meant prehistoric, so his Caucasian examples are so-called “cave men.” For the others, his primitive peoples are contemporary, or at least existed within the past 100 years — like the Indians he sculpts stalking their prey in the skins of animals. Yet, if on the whole, it is hard to get past the inherent racism of his depictions, there is also something there to admire: He attempts to give a certain dignity to his idea of primitive peoples, and some individuality to his subjects. One feel apologetic for liking these friezes, but taking out the bias (admittedly hard — or even impossible to do), one can appreciate the genuine life in them. And more, the variety of design, the variety of pose, and the ingenuity of making those designs in the restrictive space he has to work with, the thin band that circles the building. Each is broken into a nearly Cinemascope widescreen, and populated with two, three or six individuals performing a task deemed characteristic for that ethnic group. Still, the problem is summed up most egregiously in one panel: A group of African women and a gorilla, or chimpanzee (it’s hard to tell exactly what is meant — it is a generalized ape). You sense the same root from which sprung King Kong in 1933. 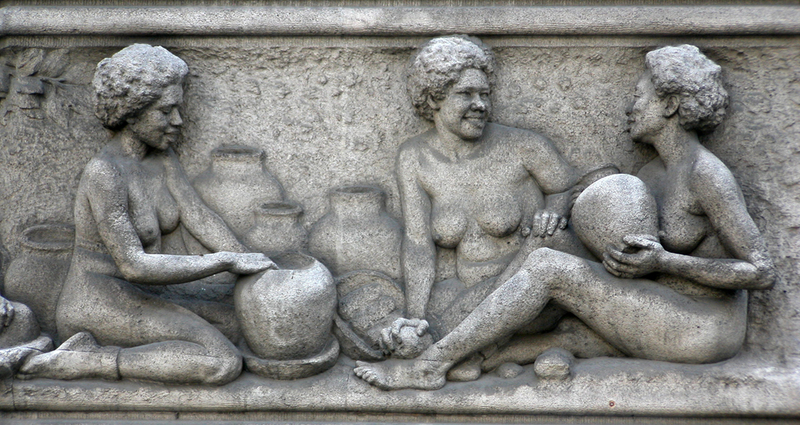 One of the women is tickling the ape with a flower. The women are naked with the same matter-of-fact prurience that used to fill the National Geographic magazine. We all grow up in a Zeitgeist, a common world view: Within it come wide variations. When Thomas Jefferson dithered over the morality of slavery, there were some few who recognized the enormity of it and rather more who accepted slavery as a given, even God ordained. But we look back at the founding fathers now with an uncomfortable eye. We find it easy to judge those earlier people by our contemporary standards. If we are to truly understand them, we need to have a second sight that judges them by what we know now, but also forgives them for what they didn’t comprehend. We all accept things now that our progeny will condemn us for. 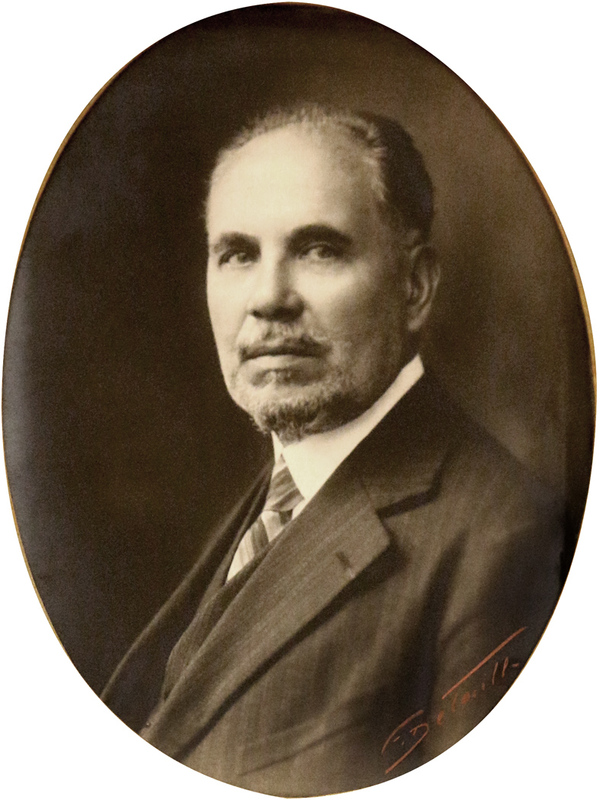 Roux had a long career and his work is found all over: A journeyman sculptor, he chiseled out whatever was required for building design, cenotaph or memorial, and was at the very least, enormously talented. Born the year our Civil War ended, he died during World War II, and his style, formed in the Belle Epoque, never really caught up to the modern art that was being made all around him, yet, with commissions like the Institute for Human Paleontology, he was up to date with the now out-of-date science of his time. One has to feel a twinge of sympathy for a man of undoubted talent, but without individuality or genius, who struggles to use his gifts as best he can in a world that has shifted around him. While Roux was still making busts of Achilles or statues for the “gloire de la patrie,” Picasso was making Cubist portraits, Matisse was painting Dance, Kandinsky was theorizing the symbology of color, Egon Schiele was stretching bones and skin into contortions of angst. Modern art was exploding all around him, but Roux kept faith with his small art. One wonders if he was even aware of a world headed into two world wars and a culture turned topsy-turvy. I have been back to the Institute, and have photographed the panels again. These images are from the first day, and only from one side of the building. I wish I had them all catalogued. You will not find Roux in your Jansen, or taught in your art history classes. One feels a need occasionally, to appreciate the many excellent working artists who will never make a dent in the progress of culture, but merely do what they do well. I enjoy all of your posts, but I think your Addendum, 2016, was wonderful – insightful and compassionate. Your remarks about Constant Roux and his friezes – “Modern art was exploding all around him, but Roux kept faith with his small art. One wonders if he was even aware of a world headed into two world wars and a culture turned topsy-turvy” – exhibit an unexpected kindness. You make me want to look harder for all of the “small art” that exists in our world. 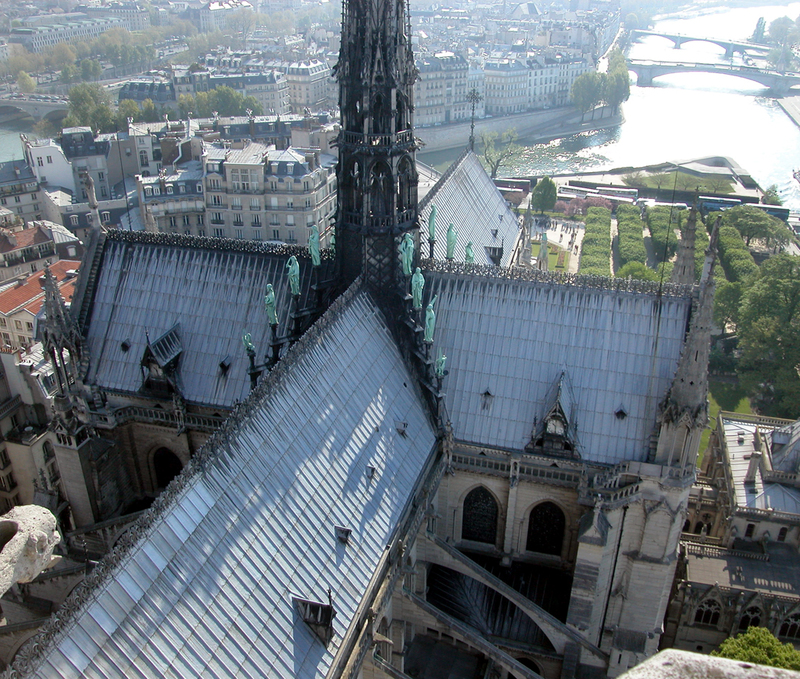 Wonderful article on the Notre-Dame Cathedral. Terrible news this evening; Lets hope & pray that it can be saved.